In early August Infuse got a healthy dose of AirPlay streaming, and since then we've been listening intently to all of you who have been using it to see how we could make it even better. Today we're happy to release Infuse 1.4 that includes quite a few goodies that mainly revolve around improved AirPlay, performance, and efficiency. We've taken our AirPlay integration a step further by adding the ability to send subtitles along with video when using AirPlay. Now, with just a few taps you can add subtitles from OpenSubtitles to videos and stream them to your TV. 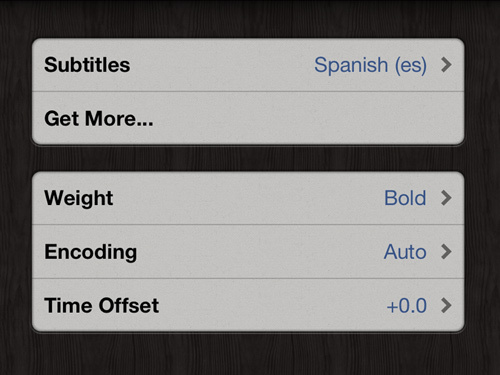 You can even pick and choose from the available subtitles right on the Apple TV! It just works. Infuse now does a much better job of allowing you to move between apps while playing videos. Not only is this just very handy, it also allows for improved battery life while streaming over AirPlay. Last but not least, we've refined and improved many aspects of Infuse to provide the best possible experience. The improvements included in 1.4 have led to smoother and crisper videos, better battery life, and a 30% reduction in the app size itself. Infuse 1.4 is now available as a free update in the App Store. We'll be back with more exciting features soon.